Brian Gavin isn’t just a brand name. Only a few jewelers are legendary enough to use their name as the company’s backbone. And those who’ve been in the industry for a while – and even those who are just discovering the pillars of the diamond world – know who “the Man, the Myth, the Legend” is. There’s no denying that he is one of the best diamond cutters ever. But how about his own diamonds? Can they live up to his title? Let’s find out! In this post, I will have a look at Brian Gavin Diamonds’ business model, their conditions of purchase, and their signature series. I will also get into the nitty-gritty of their “Hearts and Arrows” diamonds to find out whether they really hold up to Brian Gavin’s promise of only having the best. Originally from South Africa, Brian Gavin moved to America in 1985 and quickly made himself a reputation for providing diamonds of superb cut quality. His grandfather was the master diamond cutter Barend Deutz and his father Ben Gavin is a master diamond cutter himself. In his blog, Brian Gavin describes that his earliest memory, before he could even walk, is sitting at the polishing wheel with his grandfather and father. But what made him one of the biggest players in the industry was the iconic pattern he developed. Inspired by the “Hearts and Arrows” cutting style that emerged from Japan, Brian Gavin came up with his own brand in 1998 called “A Cut Above” – committed to diamonds with the best cut imaginable. In 2001, he co-founded Whiteflash.com and served as the Executive Vice-President until 2008. He has also supervised one of the world’s best grading labs and was consulted by diamond factories offering world-class diamonds. Much trust has been tailed to his reputation that when he introduced Brian Gavin Diamonds in 2009, it was automatically embraced by the diamond world. A “Hearts and Arrows” diamond is a diamond cut to ideal proportions that result in the near perfect pattern of eight symmetrical hearts when viewed from the pavilion position (table down) and in eight symmetrical arrows when viewed from the crown position (diamond facing up). 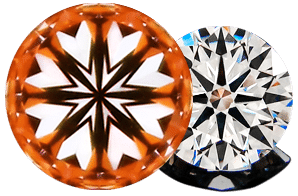 In my post about hearts and arrows diamonds, I described how they’re considered to be top-notch diamonds to which only about 1% of all produced diamonds belong. There are eight symmetrical hearts – perfectly equal in shape and size. You shouldn’t see large clefts between the hearts, but there should be a visible gap between the hearts and the Vs. Right off the gate, Brian Gavin stuns with their inventory as they hold all their Hearts and Arrows and Signature Blue diamonds in-house. I don’t know of any other online retailer that houses diamonds. 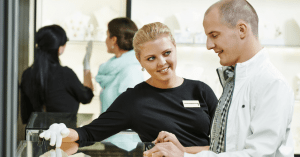 Online vendors such as Blue Nile, for instance, never get hold of the diamonds they offer and have them directly sent from the supplier to the customer. This has the disadvantage that the vendor will not be able to inspect the diamond before shipping. 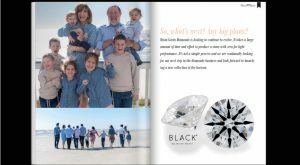 Other online retailers like as James Allen have the supplier send the diamond to their headquarters before shipping to the customer. This way, they can have the diamond examined by their gemological staff before delivery. 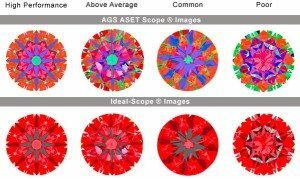 Typically, such online vendors will also provide you with ASET and/or Idealscope images which can help you in evaluating the light performance of a diamond. The fact that Brian Gavin holds all their signature series diamonds in-house is a good indicator of the quality of experience they’re committed to. Diamonds that don’t belong to the Brian Gavin signature series are first sent to Brian Gavin for examination. This way, you can get an accurate assessment and even ask whether a diamond in the VS2 – SI2 clarity range is actually eye clean or not. In fact, every diamond that is sold through the website is examined by Brian Gavin personally before shipment! Unless Brian Gavin doesn’t give his approval, the diamond will not be shipped! You, therefore, have a master diamond cutter with a reputation to lose and a firm commitment to excellence examine your diamond before buying it! Brian Gavin is, thus, able to provide a diamond picture, an ASET image, and even a Sarin report via e-mail before finalizing the sale. Once you approve the sale in accordance with the provided data, the diamond will be shipped to you via FedEx Priority overnight. Now, what I like about Brian Gavin is that they provide 360° videos of all their signature series diamonds. For the ones outside the signature series, they have sample photos. So, when shopping at Brian Gavin, I would stick to their signature series as these are the core strength of Brian Gavin. This is a great way to actually see whether your diamond has inclusions or not. And you can check out the sparkling style which is particularly crucial in a princess cut diamond. Of course, you can always ask the customer service whether a certain diamond is eye clean. In my own experience of dealing with Brian Gavin Diamonds, I have found the customer service to be highly competent and honest. Furthermore, Brian Gavin also provides an Idealscope, ASET, and hearts-and-arrows images for every diamond! These three images combined can give you an accurate impression not only of the light performance but also of its symmetry. As you can see, the diamond I have chosen as an example actually has a superb light performance, and a is a true hearts and arrows diamond. This one, however, has an inclusion. So in such a case, you should check first with the customer service if the diamond is eye clean. Brian Gavin predominantly provides AGS reports for all their diamonds. As I have explained in my post about the best diamond grading labs, you should only buy diamonds graded by AGS or GIA. All in all, Brian Gavin Diamonds provides all the necessary tools for making an educated purchasing decision. Now, let’s have a look at their Ts and Cs. 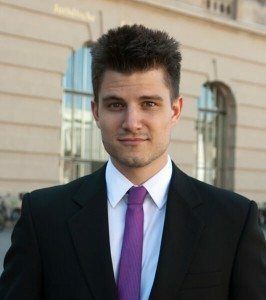 Brian Gavin offers free insured shipping but not for international customers. So, shoppers outside the US might expect to pay a shipping fee. I really think that Brian does a superb job of providing excellent customer service and more than enough data for making an educated decision. Therefore, I believe that the return rate at Brian Gavin is justified. Still, in case you want to return the diamond for whatever reason, you need to be aware that you will have to pay for the insured return shipping. It may be a fairly new addition to briangavindiamonds.com, but The Little Black Book is just in time for the modern readers and shoppers out there. Long, in-depth articles and reviews are still boss, but the younger audience prefers big and bold images for a reason. Brian Gavin Diamonds is known for Brian Gavin himself and his super-ideal Hearts & Arrows diamonds. This reason alone should urge you to buy from them. Yes, it’s not cheap because you’re paying for decades of mastery. You can say that it’s all in the name, just like massive fashion brands today. But at least in Brian Gavin Diamonds, you’ll see with your own eyes that the superb fire and brilliance are worth the premium price. You’ll see the diamond sparkle like it's indeed cut by a master cutter. In the next part of my Brian Gavin Diamonds review, I will dig deep into their Signature Hearts & Arrows Diamonds! Read on to find out more!